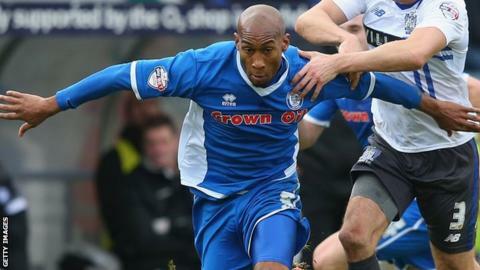 Rochdale striker Calvin Andrew has signed a new one-year contract, while eight players have been released. The 29-year-old joined Dale in 2014 after his release by York City and scored six goals this season. Grant Holt, Nyal Bell, Rhys Bennett, Billy Hasler-Cregg, Reuben Noble-Lazarus, Joel Logan, Michael Rose and David Syers have been released. Ashley Eastham, Olly Lancashire and Josh Lillis have been offered new contracts at Spotland. Jamie Allen, Joe Bunney, James Hooper, Nathaniel Mendez-Laing, Donal McDermott and Joe Rafferty have had their options on new contracts for next season taken up. Meanwhile, Brian Barry-Murphy and Steve Collis have had their player-coach deals renewed.